It is not our intention to engage in a war of words, or to insert ourselves into the workings of another registry that has the right to exist. However, recent publications from the Pre Mundial Registry have misstated facts and misled the Breeders of PRE Horses in America to such an extent that we are forced to clarify exactly what we know to be true about the Pre Mundial Registry and their claim to represent the PRE Horse. Pre Mundial is an American Breed registry that has every right to exist in the United States and register horses called by a breed name owned only by them. They have the right to employ whomever they chose to approve, judge and market their horses, and they may use their finances and treat their members any way they feel fit. They MAY NOT pirate the name of another breed of horses. Pre Mundial may call their breed of horses anything they want EXCEPT the PRE (Pura Raza Espanola) Horse. 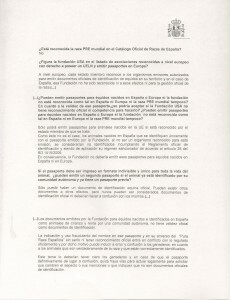 Pre Mundial has no right to register or represent in any way the PRE Horse, as determined by the government of Spain and the Ministry of Agriculture and Rural and Marine Resources (MARM). The Government of Spain owns the one and only Studbook for PRE Horses and has the right to appoint a manager of said Studbook, which is currently the Breeders’ Association known as ANCCE. There is no other way to obtain PRE papers except to go through ANCCE. Pre Mundial would like you to believe that there is more than one way to register a PRE horse. This is not true. 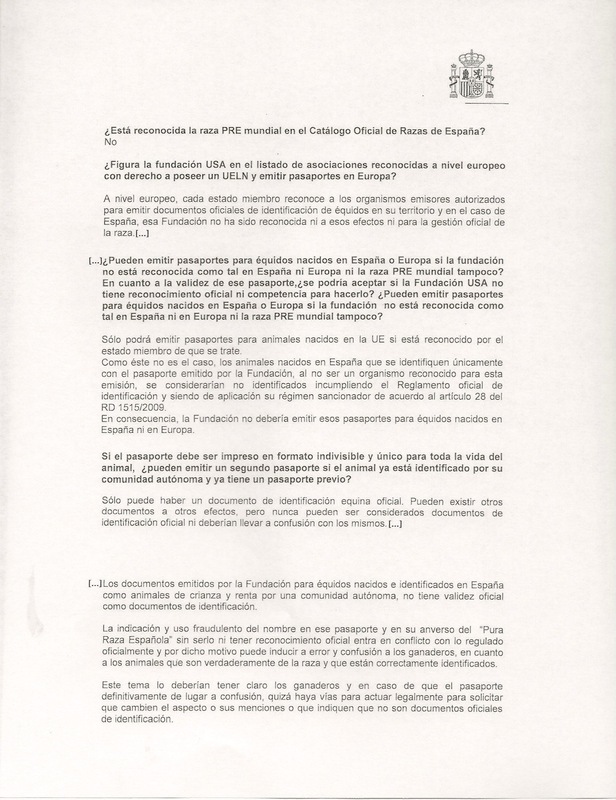 There is no confusion in Spain as to which entity has the right to register the PRE Horse. It is ANCCE and only ANCCE. 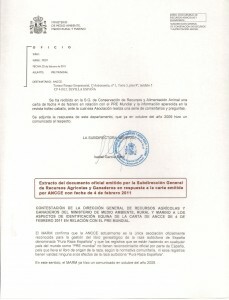 On February 25, 2011 MARM released a statement condemning the Pre Mundial registry as a fraudulent registry which is not authorized by any Spanish authority or the European Union to register or represent the PRE Horse. This statement is attached at the conclusion of this letter. It is current, final and relevant to all US Breeders who desire to register their offspring as PRE Horses. Pre Mundial has the ability ONLY WITHIN THE UNITED STATES to issue UELN (Universal Equine Life Numbers) numbers for something called a “Pre Mundial” horse, which is NOT a PRE Horse recognized by Spain. Pre Mundial has NO AUTHORITY by the European Union to issue UELN Numbers or Passports for PRE Horses born anywhere. Outside of the United States, Pre Mundial cannot issue numbers for any breed whatsoever, including their own “Pre Mundial” horses. Pre Mundial has joined forces with a Breeder’s Association in Spain that is referred to as UCCE. We celebrate their right to do so. Let it be made clear, however, that UCCE members DO NOT register their horses with Pre Mundial. All UCCE members continue to register their horses as PRE Horses through LG ANCCE, the official Government-owned Studbook for the PRE Horse. 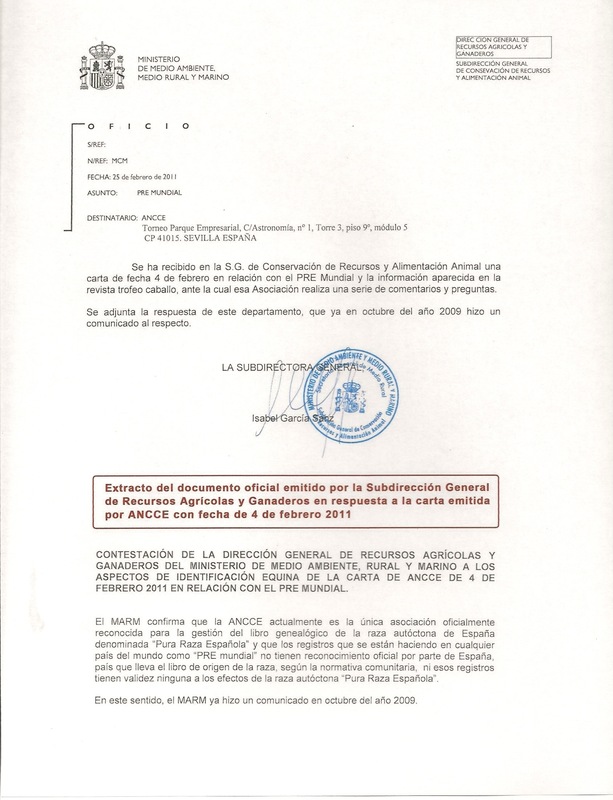 The Spanish Government has issued the most recent statement condemning the pirating of the name of their treasured breed, the PRE Horse, as part of a larger attempt to address the problem of the Pre Mundial registry which the United States equine federations are unknowingly allowing to operate while counterfeiting the name of a breed that is officially owned by the Government of Spain. The United States Equestrian Federation, and other livestock governing bodies, have been notified of this American registry’s (Pre Mundial) attempts to register and issue papers for a European breed without authorization. A PRE Horse is the product of generations of tradition, research, veterinary and academic oversight and breeder and rider expertise. The guardians of the PRE Horse—MARM and ANCCE in Spain, the USPRE Association in the United States, along with other officially approved PRE Horse associations around the world—will not allow another registry to counterfeit the good name of the PRE Horse for their own benefit. The high standards of our horse must be protected and are in good hands under the oversight of the Spanish Government who has been the rightful owner the Studbook since its inception centuries ago. Breeders, be vigilant and do not be deceived! Read your documents carefully! A Pre Mundial horse is NOT a PRE Horse! If you want to have authentic Spanish PRE papers for your horses, you can only do so by registering your horses with LG ANCCE. Dear Breeder, It is not our intention to engage in a war of words, or to insert ourselves into the workings of another registry that has the right to exist. However, recent publications from the Pre Mundial Registry have misstated facts and misled the Breeders of PRE Horses in America to such an extent that we are forced to clarify exactly what we know to be true about the Pre Mundial Registry and their claim to represent the PRE Horse.